I just received my first order from Lucky Gunner. Two days earlier than promised, packaging is very sturdy and undamaged. Kudos to Lucky Gunner, you have a customer for as long as I can shoot. You folks rock. I recently purchased a case of this ammo while I was waiting for my Ruger SR22 to arrive at my local gun shop. This is my first 22 so I was surprised at how small a case of 5000 rounds is in comparison to my other ammo. As usual with lucky gunner it arrived promptly and the packaging was perfect. Last Saturday at the range I put 200 rounds through the new pistol without a single problem. The Blazer ammo shot flawlessly and accurately too. I would recommend this to anyone looking for good range ammo and I will purchase this again. 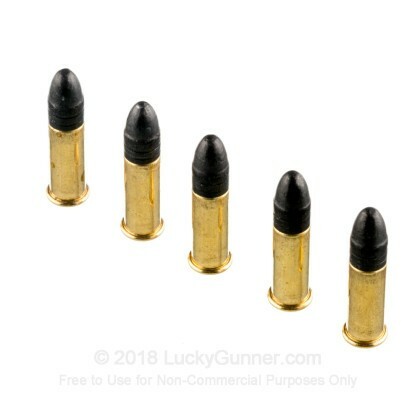 Best cheap .22 LR ammo out there. 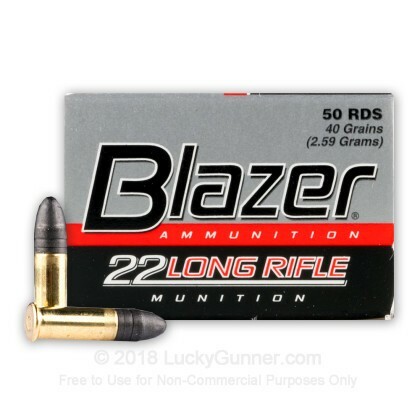 Been using Blazer .22s for 40+ years. Very accurate. Rare inconsistent load. A little waxy. Good ammo and great service! Couldn't be more pleased with my first purchase from LG! Great customer service. Prices and super fast shipping. Looking forward to doing more business. I bought this to stock up and give plenty of ammo for practice and plinking with my sons. The value was unsurpassed and the service of Luck Gunner excellent. The order went through without a hitch and it was delivered promptly. I will buy from them again. I've only shot 150 rounds, but so far no issues. I bought 5000 rounds..no jams after 500 rounds...great price...wil buy 5000 more soon. Cheap fun, what more can you say!? Went through 1500 rounds in a couple weeks, no FTF or FTEs. Good value for all around plinking, putting up 1 1/2" groups at 25yds. with an old iron sight Winchester 67 and Western Field 59. Will buy more when we need. I've shot about 1000 rounds through my Walther P22, and haven't had one problem. Surprisingly, I put 200 rounds of CCI Mini-Mags and had 2 misfires. None for the Blazers. 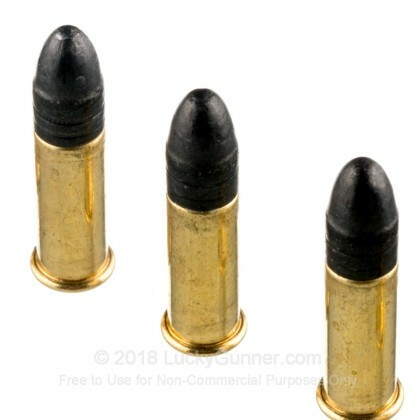 I wouldn't try any other ammo. Got 5K of this. I'm not disappointed. Ammo has a nice sharp crack to it more like the better quality 22 I buy. I have had a chance to bench shoot it yet, But it shoots and cycles well off-hand. I have shot less than 500 rounds of this ammo and I had about 7 duds from a sig 522. I did not try firing from another gun but I know it works from time to time. The other thing I like it is a clean round. Stuff goes bang every time -- 'nuff said! I typically use CCI Mini Mags but I wanted to try this and had no problems at all in my Sig Mosquito. Fired 150 rds. No issues. 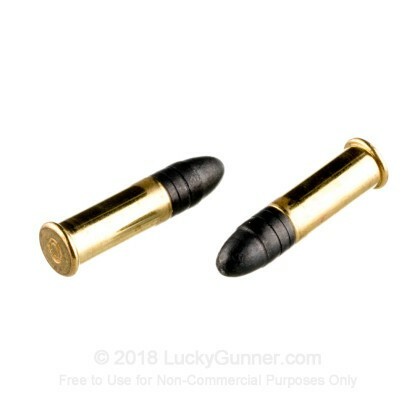 Very good ammo for the price. Great service from Lucky Gunner. Bought 10,000 rounds,no missfires.Great ammo.Will be buying alot more. 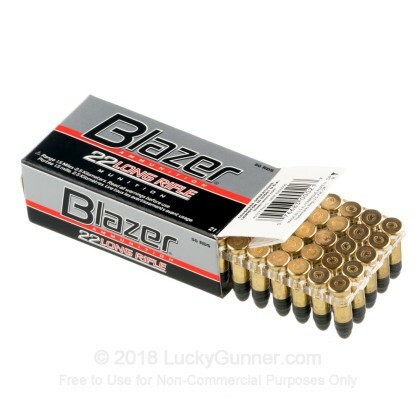 Great value and speedy shipping, ammo works great in my P22,,as well as AR15/22, can't beat the price and quality of CCI Blazer! AFTER SHOOT MY 100 ROUNDS OF 9MM AND 380, I CAN BLAST TILL I DROP WITH MY LITTLE P22. Purchased 5000 rounds, have shot 2000 rounds so far without any issues. Works well in Ruger 22/45 although it contains some wax coating on the bullet that one should remove before loading in the magazine. Experience will make this automatic. No problems in Ruger Charger, Sig P522, and others. This has become my only. 22 ammo, I must order more. GOT THE SHIPMENT FAST AND NO MISS FIRES GREAT AND GREAT PRICE. I have only fired about a 150 rounds through my beretta U.22 Neos, but so far it has been flawless. A lot of reviews said that this stuff was very smokey, but i shot it on a 15 degree February day and didn't notice much smoke. Plus at $0.03 a bullet who really cares! I have shot around 600 rounds of this ammo so far with 1 FTF in my Ruger MKIII 22/45 pistol. It's great ammo and at a great price. This ammo is MUCH better than most inexpensive ammo. It shoots clean, doesn't gum up your gun, and it loads perfectly with my speedloader. I can't say that for most inexpensive ammo (Winchester 333 or 555, Remington, or Federal). I would recommend this deal and this ammo to anyone looking for inexpensive, quality 22 caliber ammo. Cheaperthandirt was easy to work with and my ammo arrived in less than 1 week with standard shipping. All of the ammo comes in boxes of 50 rounds (all packaged individually, not just dropped in the box) that are packaged in 500 round boxes (ten fifty round boxes). These all come in a packing box that contain all 5000 rounds. Buy it, you won't be sorry! 1st time buyer, I love your fast service and I will buy from you again. I purchased 5000 rounds and I am having fun shooting my S&W M&P 15-22. The ammo has not jammed yet. One box that I opened had an empty shell case. Being the 1st time buyer, I was skeptical about the price and this website. Well, I'm glad I bought this bulk pack. Very quick shipping and packaging, no problems! Shoots great through my Walter P22, Ruger MKIII, and my .22'ed AR. Have a Walther P22 and a Sig Mosquito. Both of these guns run this ammo without a hitch and I mean without ANY hitches. Great product regardless of smoke and the price is right. purchased 5K rounds, have run used several hundred and no problems. Ammo works. It is smokey but for the price like another poster said who cares. As for LG, this was my third order from them, they are great to do business with. If the Cal ammo law stays overturned (1/18/11) I will continue to buy all my ammo here. Great product for the money! Product does smoke a lot but who cares! This is the best .22 lr for plinking in the world! Never a problem in any of my .22's. I would and have recommended it to a friends. with out a jam or misfire. Can not say that about ( Fed. or Rem.) great value. As for Lucky Gunner , they are now my #1 ammo supplier Thanks LuckyGunner. Finest kind transaction. Smooth and efficient. I've put about 2,000 rounds through a S&W M22a without one jam or failure to fire. Excellent performance! Good plinking ammo... I was looking for quantity and good quality at a good value and am not disappointed. I bought the 5,250 round box - LG has been a great find for me - I don't like to waste time on poorly formated websites and again, I'm not disappointed. Shipments (2 for me) have been fast to ship and arrive on time, as expected. Q: What would be the rebate on the 5000rnd order? Q: Is this a 5000 round case 10 500 bricks 50 rounds per box case? Or is it all 5000 loose? A: Hi Richard. This Blazer will be 10 500 round bricks with 50 rounds per small box. 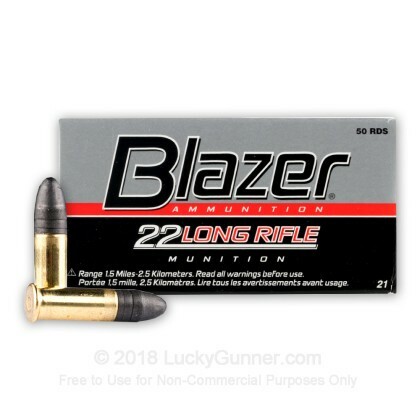 We also have this 22 LR - 40 Grain LRN - CCI Blazer - 50 Rounds ammo in stock in a smaller quantity. We also have this 22 LR - 40 Grain LRN - CCI Blazer - 500 Rounds ammo in stock in a smaller quantity.